In the second match of the day, the battle between the two best teams of the past few years continued. The Dubai Dragons and Multiplex Bulls have dominated the competition for the past few years, and the Dragons have enjoyed great success. However, results have always been close. The pattern continued with another Dubai thriller. Little separated the two teams in the first half. By the main break, the Dragons had snuck ahead by just two points. The second half was just enthralling as the Dragons tried to consolidate their lead and the Bulls tried to peg it back. By the end of the match it was the Dragons holding on by just three points, setting up their season and continuing the heartbreak for the Bulls. 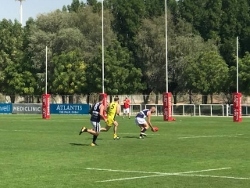 The next round of matches on November 23rd will see the Abu Dhabi Falcons hosting the Dubai Dragons whilst in Dubai the Multiplex Bulls will take on the Dubai Dingoes.